I hope everyone has enjoyed their summer, whether it was spent at the pool, the golf course, or the beach; it was hot, and it was humid. Just in case if anyone was interested, when applying sunscreen to your toddler repeatedly getting it in their eyes won’t convince your wife to stop asking you to help every time. It just leads to screaming kids. That was my summer in a nutshell but it was an excellent one nonetheless. Quick note, make sure you don’t try and swim too early in the season or you may end up like this enthusiastic fellow…..
For all the times I wasn’t able to give everyone who asked me that question over the summer a better answer, here is your answer. No doubt by the end you will regret ever having asked. 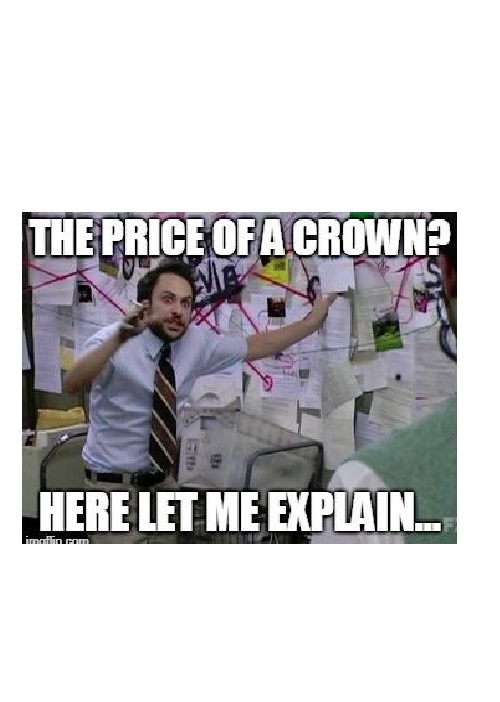 There are a few variable outside of the clinical treatment itself that determine the cost of a crown, if you have insurance or not, the price your insurance has negotiated for a crown, and what percentage that insurance pays towards the overall cost of the crown. NOTE: If you choose to get dental insurance but want to pay less monthly you can buy the “direct fee schedule option” where you get the negotiated rate but must pay all of that amount and the insurance pays none of it. There are many other aspects (aka the fine print at the end) that could cause the price to vary but for this example, drum roll please……..the cost of an all ceramic crown or D2740 in zip code 27615…. in storybook form. Once upon a time there were seven dwarfs who mined gems for the corporation 7 Dwarfs Diamond and Dirt Depot, and although they worked together, they each set up an individual LLC and each corporation had it’s own human resource department which lead to each of them coincidentally and conveniently for us having separate dental plans with several different dental insurance companies. Here are the 7 Dwarfs and their associated fee for an all-ceramic crown. Grumpy- Being grumpy he fired his HR representative and therefore had not signed up with any dental insurance company nor did he choose to be on the FFD In-house plan. As a result, he did not receive the lower negotiated dental insurance fee or 25% off of our standard fees. Sleepy- He was too tired to get dental insurance and told his HR department he would just do the FFD in-house plan and would pay once a year to receive 25% off standard fees. Sneezy-This germ spreading gent chose to get Delta dental insurance which usually covers %50 of the cost of a crown with a negotiated rate of $1035. Bashful-This socially anxious fellow also chose to get Delta Dental, however, he decided to pay less monthly and got the “direct fee schedule” option where he is responsible for the entire portion. Dopey-this kind soul, “bless his heart” also chose a “direct fee schedule” option but he went with a different insurance company, Dental health alliance. As you can see they have a different negotiated rate compared to Delta Dental. Doc- the veteran of the group went with Dental health alliance as well but chose to pay more monthly than our friend Dopey up there so his insurance would cover a portion of the crown. This insurance offers a low option and a high option. Usually, the high option covers a higher percentage of procedures but is more expensive each month compared to the low option. It often also has a higher max but we are ignoring yearly maximums to simplify this example. Yes, remember this is the simplified version. Our pal Doc went with the low option (50% on crowns and 80% on fillings). Happy-Lastly our perma-grinned pal here went with Dental Health Alliance but splurged for the high option plan so he will have his crown covered at 80%. Yes thankfully there are only 7 Dwarfs and this is, in fact, the last example. Truth be told we could have done 101 Dalmations with all the possibilities so consider yourself lucky. Other factors that have been omitted in order to “simplify” the explanation. Waiting periods- At times you have to be on an insurance for six months or a year before they pay towards any treatment. Deductibles- You must pay $50 to $100 or more and only then will insurance begin to pay towards treatment. Yearly maximums- Insurance will only pay up to a certain amount per year, typically between $500-$2000. Downgrades- Sometimes insurance will only pay for a silver crown on back teeth and therefore cover 50% or 80% of a lesser fee regardless of what type of crown is actually done. Replacement clause-Insurance companies may not pay for a new crown if they paid for a crown on that same tooth within the last 5-10 years. There are a few more variables but I think you get the point. I hope you get an idea of why I can’t just give you a price when you ask that question, I am not trying to be evasive or difficult with my answer. Great blog – as usual!!! Thanks for keeping us informed along with your wittiness and humor! This just might be your masterpiece. Now I know why it took so long between your last blog and this saga. Disney characters have been used for hundreds of things, but I don’t think Walt ever dreamt that his characters would be used in a dental blog!